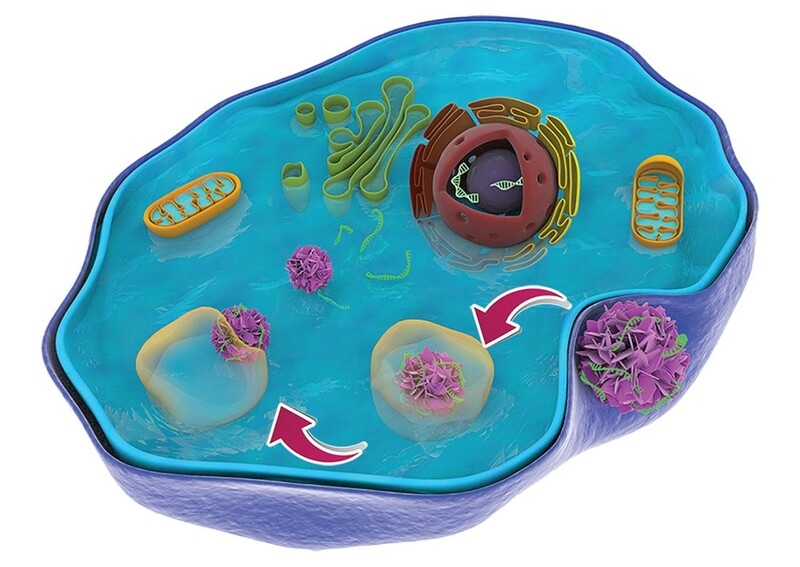 Illustration of the "peptoid nanoflower" making its way into a cell to deliver therapeutic genes. A piece of paper may seem thin to the naked eye, but it's roughly 100,000 nanometers thick — giant in the world of nanotechnology. Try to imagine something nearly 1,000 times smaller than that. Researchers at Washington State University have developed a particle that size that could potentially serve as a vessel to deliver gene therapies or other treatment directly into cells, a finding that could prove instrumental in cancer treatment. Gene therapies are promising methods to replace, or deactivate, a mutated copy of a gene in a cell or to introduce a new gene to help fight an illness. While promising, gene therapies are considered risky and are still only used in situations where no other treatment is viable. One problem has been effectively delivering the therapeutic material past a cell's natural defenses and into the heart of the cell where it can go to work. The other is making sure the "vessels" containing the material aren't toxic. Yuehe Lin, a professor with the WSU School of Mechanical and Materials Engineering, says previous research on nanoscale material has typically been done by material scientists or chemists and the focus hasn't been on medicinal uses. Lin thinks this research could help change that. "Nanoscale material can really be used for patients," Lin says. The WSU researchers synthesized peptoids that are similar to natural peptides that make up proteins, creating what Lin calls "peptoid nanoflowers." The newly created nanomaterials were loaded up with a model drug molecule and then researchers watched as the nanoflowers slipped past a cell's defenses, offloading the cargo once inside and exhibiting minimal toxicity to the cell along the way. Lin and his research partner, Chunlong Chen, senior scientist at the Department of Energy's Pacific Northwest National Laboratory, published their results in the journal Small. For that paper, they used model drug molecules as cargo, but they hope to use real therapies soon. "This paves a new way for us to develop nano-cargos that can efficiently deliver drug molecules into the cell and offers new opportunities for targeted gene therapies," Lin says.